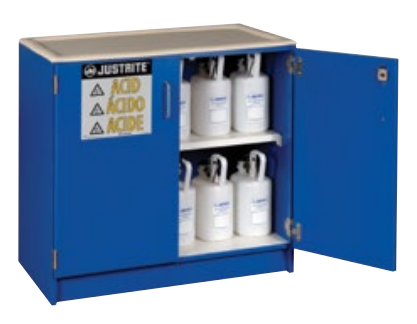 Safely store highly corrosive liquids such as phenol, nitric acid and sulfuric acid in these wood laminate storage cabinets. Long lasting wood construction along with stainless steel handles and hinges provide exceptional resistance to corrosion from harsh acids. Shelf adjusts on 1-1/4-in (32-mm) centers to accommodate a wide variety of containers. Cabinets include adjustable leg levellers, Haz-Alert reflective labels, and double key set for safety and security. Countertop model 24120 is ideal for smaller quantities used at workbench level. Use the under counter model 24140 as a free standing piece. It includes a removable, easy-to-clean polyethylene work surface top that is recessed 5/8-in (16-mm) to help contain incidental leaks.